Do you like wild animals? Do you know you can learn about wild animals from your pet at home? 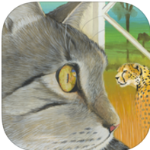 My Wild Cat is a digital book teaching kids about the big cats in the wild through watching the cat at home. It is a unique way of teaching kids about wild animals through things they are familiar with already. 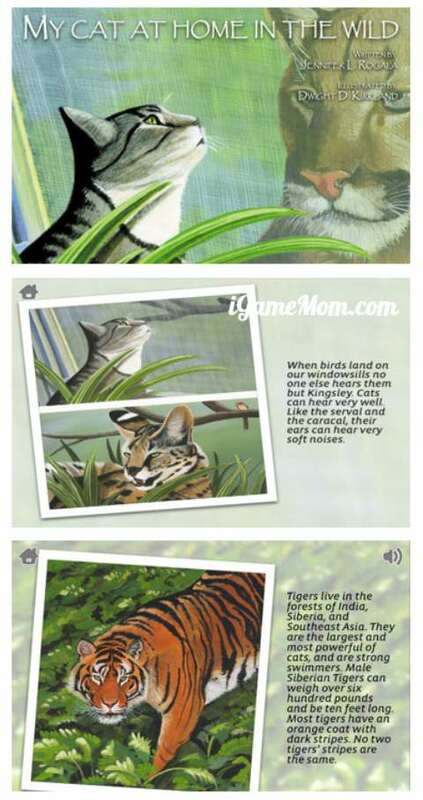 In the book, kids will learn about 10 big cats through observing the cat at home. Some of the big cats are tiger, cheetah, lion, jaguar, leopard, cougar, leopard, caracal, serval. The intent of the book is not to give comprehensive introduction of these big cats, but instead, is to pointing out some interesting connections between the cat at home and the big cats in the wild. For example, from cats hiding behind the plants, the author draw the connection to cheetah hiding in the tall grass. When the cat lying still in a box or a paper bag, she is like a jaguar in the rain forest trying not to be seen. Through the connections between home pet and wild animals, the book explains some of the cat’s behaviors. For example, when the cat doesn’t finish his food and cover the left-over with a blanket, she’s saving it for later, like tigers and pumas hide food under grass and leaves in the wild. When the cat rubbing her face on your leg, she is leaving her scent on you to make you part of her family, just like the members of a lion pride. Of course, there are differences between home cat and big cats. Cats at home can meow, big cats in the wild roar. Cats at home will snuggle with your when you are reading, the big cats in the wild won’t. After finishing the book, kids can find the additional pages on basic facts about the big cats. There are also puzzle games from the pages in the book. It is a simple yet very interesting book. It will encourage kids observing more, thinking more, and as a result, more interested in learning more about the animals. 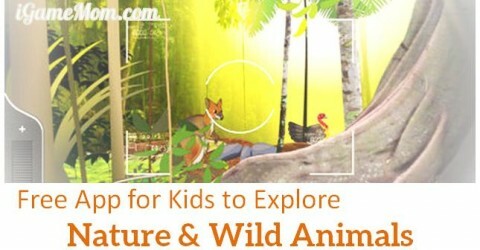 For more apps to learn about wild animals? Check out this free app of WilderQuest. You can also play with it on their website.